As a Mercurial Woman, the Throat Chakra is forever my jam. Being a Gemini Sun + Virgo Moon, I'm ruled by the planet of Mercury, of communication. It's what fuels me to share with you episodes of the Sovereign Goddess Podcast, show up in all my rawness on my Instagram and on blog posts here at SabrinaRiccio.com. It allows me to go up in front of hundreds of people and teach Kundalini Yoga effortlessly. As I go through these last months of my Saturn Return, 29 is the age where the Throat Chakra begins to be developed. Vishuddha, the Throat Chakra, is a power center and the place where you are able to Speak and Live your Truth with conviction. Here, you'll find your confidence, independence and a sense of security. Developed during the years of 29-35 years old, this is the space where you're able to live from experience and show up in the world as you authentic, rad self. Now that you've developed your lower triangle, the Throat Charka is the first step of the upper triangle where you get to begin to live your life from your Spiritual Body. The heart becomes the center and connector between the lower and upper triangle. You can tell your Throat Chakra is weak if you experience doubt, fear, insecurities, anxiety attacks, guilt, negative thought patterns, manipulation, headaches, colds, TMJs, and thyroid issues to name a few. Because of your experiences, you are able to live in this world from a higher perspective. The throat chakra is where you begin to speak up for yourself, be receptive, live your Sat Nam, your truth, communicate your needs, and keep your thoughts elevated. 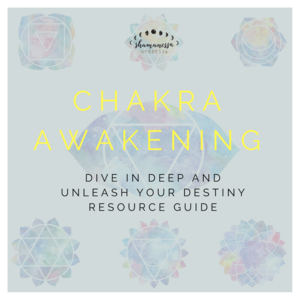 If you want to learn more about the dysfunctions, how to balance and strengthen your Throat Chakra, check out the freebie I've shared with you below! In the meantime, I've compiled 5 of my favorite Kundalini Mantras to Strengthen and Support the Throat Chakra. Let me know how they allow you to express your authentic radness! Saa is the Infinite, the Totality, God. It is the element of ether. It is the origin, the beginning, and it contains all other effects. It is subtle and beyond. Harå is the creativity of the Earth. It is the dense element, the power of manifestation, the tangible, the personal. These sounds are woven together and then projected through the sound of ung or complete Totality. This is the base mantra of all mantras. Adversity melts before this mantra. It gives you the capacity of effective communication so your words contain mastery and impact. This mantra helps you conquer the wisdom of the past, present, and future. It brings you peace and prosperity even if it wasn’t in your destiny. This mantra takes away negativity from within oneself awakening the Infinite Creative energy to burn away obstacles to achieving higher consciousness. This mantra meditation from the Siri Guru Granth Sahib is a gift to you that will let you penetrate the unknown without fear. It will give you protection and mental balance. Cuts Negativity inside and out. True in the beginning, True throughout the ages, True even now, Nanak says the Truth shall always be. The focus of this mantra is to help remove blocks when you get stuck and help get you moving. You are always you. If you know me, you know how much I love music. Check out a playlist I’ve compiled for you featuring some of my favorite renditions of the mantras listed above over on Spotify to express your Throat Chakra. HOW ARE YOU WORKING ON STRENGTHENING YOUR THROAT CHAKRA? I'D LOVE TO HEAR YOUR STORY! SHARE BELOW AND FEEL FREE TO SHARE THE LOVE.